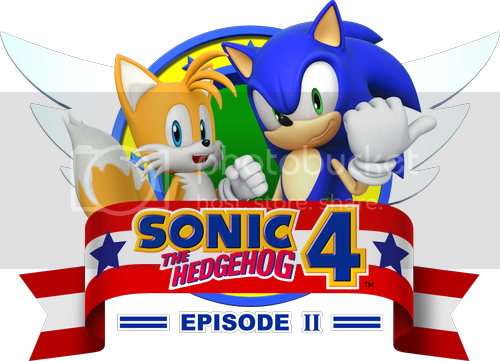 When Sonic 4 Episode 1 was released back in 2010, it aimed to bring Sega’s mascot back to his 2D roots that fans wished for. What fans got was a Sonic that that felt off; mostly the physics of Sonic himself was off. Combine that with levels that were moderately fun resulted in a game that was enjoyable, but did not quite capture the essence of what made a great Sonic game. With the development and release of Sonic 4 Episode 2, Sega and Dimps try to address the fans’ issues. Did they succeed, or does Sonic trip over his red sneakers? First off, by far the largest complaint of Episode 1 was the physics of how Sonic controls. Rest assured that this has been mostly corrected for Episode 2. The momentum based movement of Sonic is back in almost full swing. He no longer stops mid-jump if the d-pad is released, nor will he walk up near vertical slopes like they are nothing. One of the things that was not addressed is that Sonic does not gain speed if going down a hill rolled up in a ball. It is rather awkward seeing him rolling downhill at the same speed as him running down. Aside from this little blemish, Sonic controls very similarly to how he used to in his classic Genesis incarnations, which is to say very well. Just as Sonic 4 Episode 1 tried emulating the original Sonic the Hedgehog, Episode 2 tries to bring back the feel of Sonic 2. The most notable feature at first is the return of Miles “Tails” Prower. The lovable twin-tailed fox is back, and this time he is not relegated to trying to play catch-up with Sonic the entire game. Very similar to his Sonic 3 incarnation, Tails is able to assist Sonic by teaming up to either fly him around, swim Sonic through underwater sections, or combine for a rolling attack that is like a super spin dash. Thankfully, this time you will not have to fumble between two controllers if you are playing solo as Tails can be called by the press of a button. 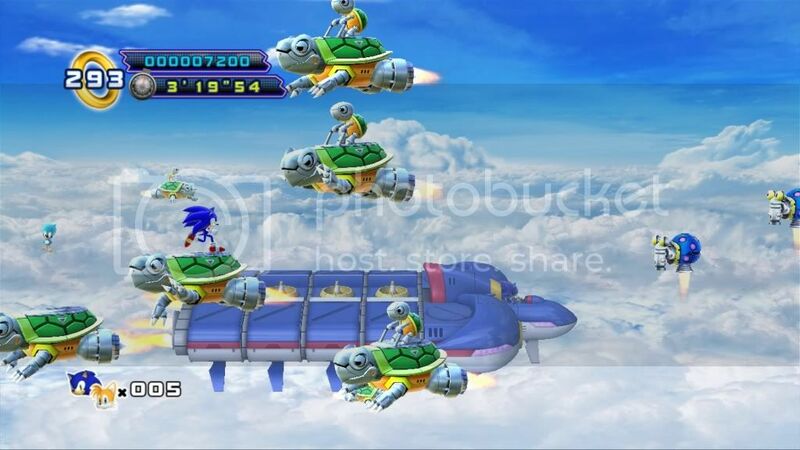 The inclusion of these team actions would hopefully bring about more open levels to explore like the ones in Sonic CD. Unfortunately, this is rarely the case in Episode 2. Most of the levels in Episode 2 do not encourage much exploration with Tails. 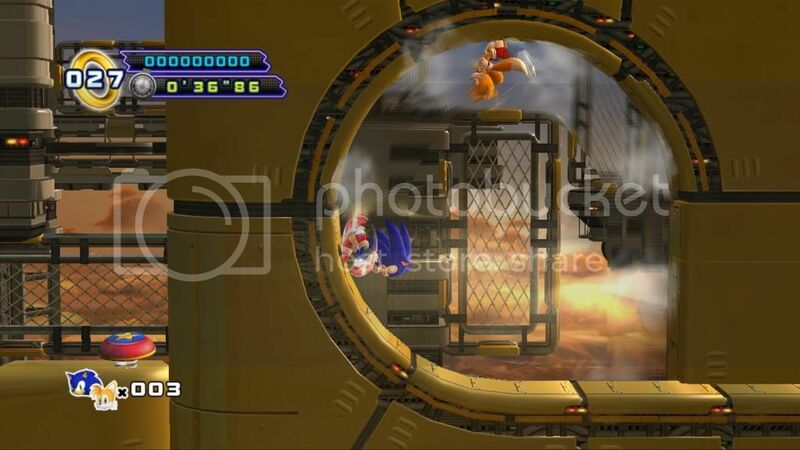 More often than not you are forced to use Tails at specific sections of levels such as carrying Sonic over bottomless pits or breaking through a series of walls with the rolling attack. 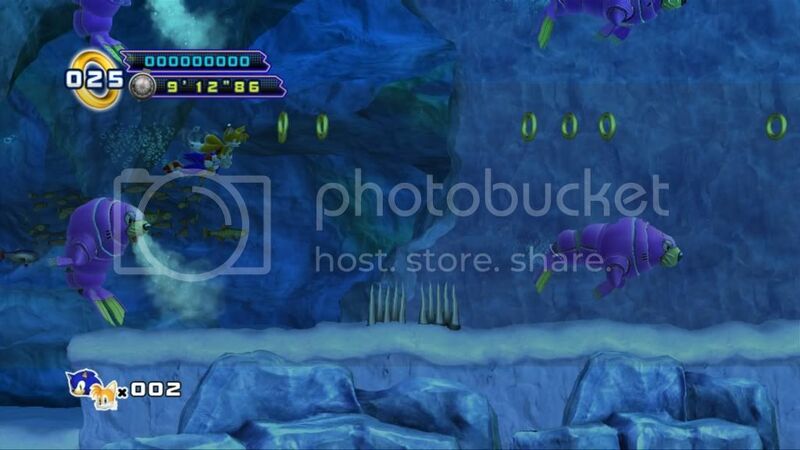 Any time you come across these segments, the game flatly tells you with a large obvious sign that you absolutely need to use a specific action with Tails, or you are not moving on with the level. It feels a bit restricting with what you can do when Tails is being forced onto you. That is not to say that having Tails is a bad thing. His abilities do still have some benefits outside of the forced moments. Considering he will warp right to Sonic at the press of a button, his flying can be a saving crutch for missing a jump or to get to shortcuts in a level that seem just out of reach. The rolling attack has its uses if only for the fact that it can move quicker than old-fashioned running, which is beneficial for anyone doing speed runs through stages. The addition of Tails for Episode 2 is not game changing, but makes for a nice extra feature when it is not being shoved down your throat. Aside from the forced Tails’ segments, the level designs of Episode 2 are very hit or miss. A couple of stages like White Park Act 2 suffer from the “hold right to win” linear layouts that are common of Dimps’ developed Sonic games, which can be pretty mindless. Sonic may be fast, but linear effortless levels completely miss the point of what made Sonic great back in the day: speed mixed with good platforming. Thankfully, most levels do get this point with some fun designs. They feature a varied layout that showcase Sonic’s trademark speed, but mix in platforming elements for variety and skill based challenge. A number of the later levels in Episode 2 are like this, and they really capture what makes Sonic fun. However, one point has to be said that a lot of what is featured here in Episode 2 feels almost too familiar. While the game does take a lot of influences from the Genesis games, it plays it safe and does not get too crazy with its levels. It is a shame since the few times Episode 2 goes outside the box are some of the most memorable. Some of the newer concepts like the gravity twisting Death Egg Zone Mk.II are actually rather creative, but are criminally underused. It makes for a solid game, but it seems too afraid to take some chances. Continuing to take inspiration from Sonic 2, Episode 2’s special stages mark another return of the half pipes. Very much like its Genesis incarnation, Sonic and Tails constantly run along a half pipe trying to collect enough rings to proceed to the next section until they reach a chaos emerald. For the most part they are still as fun as before. However, five of the seven special stages are complete pushovers with far more rings than needed for the emerald. The lack of challenge until the last two emeralds removes a bit of the satisfaction of earning them. The boss fights of Episode 2 are easily one of the worst aspects of the game. Whether it is versus Dr. Robotnik or Metal Sonic, most fights are long, drawn out battles that last for far longer than they should. The fights against Metal Sonic are pretty uninspired as all of them are chase scenes. Robotnik does not even seem to try either as he battles Sonic in giant robots that are all show and very little action. Ironically, the final battle is the complete opposite: it is unique, challenging, and actually fun to fight. If only all of the other fights were as inspired as the finale. Sonic 4 Episode 2 also features co-operative play locally and online. Playing with a partner should be fun, and promote actual teamwork between players; Episode 2 feels like its doing the complete opposite. Anytime one player gets further ahead in a level, the other player will automatically be teleported next to them. This results in one player constantly dragging the other along considering how speedy the levels can be traversed through. In terms of the team actions, all it takes is one player to press the button, and the other is forced to the action whether they wanted to or not. The co-operative play in Episode 2 is not so much co-operatively working together, but more like one player controls the actions of the other player. Visually, Sonic 4 Episode 2 is rather detailed and great to look at. The character models for Sonic and Tails look great and show off the nice animations of the duo. Each of the levels displays detailed and varied environments. Whether it is the snowy amusement of White Park or the drillers and refineries of Oil Desert, each act of the game looks different and is quite a spectacle to run through. It would have been nice if the camera was pulled back a bit to show off the beautiful levels more, while also letting you see more of what is ahead of Sonic’s path. Unfortunately, the music of Episode 2 does not quite match the quality of the visuals. The tracks vary between being alright but forgettable to my ears are bleeding terrible. It seems like it tries too hard to emulate the sound of the Genesis with its music. Most tracks have a distorted electronic sound that can be grating to the ears thanks to the overuse of synthesizer samples. However, there are a few tracks like White Park Act 3, Oil Desert Act 3, Sky Fortress Act 2 and 3 that are decent to listen to. For those of you who have Episode 1, there is a special unlockable for purchasing Episode 2 on the same platform in the form of Episode Metal. All it consists of is four levels from Episode 1 where you get to play as Metal Sonic. For all intents and purposes, Episode Metal feels slapped together. Metal Sonic does not play much different than Sonic, and the four levels are the first levels of Episode 1 played in reverse order. The only changes in the levels are the doubled enemy count and throwing in more spikes. You are not missing much if you are unable to play Episode Metal for whatever reason. In the end, Sonic 4 Episode 2 is a very mixed bag of a game. On one hand, it corrected most of the physics issues of Episode 1, the game looks great, Tails’ return is mostly welcome, and some of the level designs make doing speed runs an enjoyable thing still. On the other hand, the level design is still lacking in numerous spots, the music is mediocre to awful, and the boss fights are bland. It has some of the elements of a great Sonic game, but numerous other elements hold it back in the realm of mediocrity.